Tom Randall will be a key man for Netherton against Deeping Rangers. Netherton United manager Jon Harrison reckons a shock defeat ;ast time out will turn out to be the best thing that happens to his team this season. The city side’s 11-month unbeaten run in the Peterborough Premier Division came to a surprise end two weeks ago (September 3) when Deeping Rangers launched a successful raid on Fortress Grange. Chris Hansford (5) will be back for Netherton against Deeping. A quirk of the fixture list means that Netherton’s next outing is at Deeping Rangers tomorrow (September 10). It’s perfect timing according to Harrison. “We made so many mistakes at both ends of the pitch when Deeping beat us,” Harrison claimed. “We missed about 11 scoring chances and let in a couple of bad goals. Tom Randall scored one from about four one-on-ones whichh is not like him. “I slipped up with my team selection as well. I let a lad go down to the reserves who would have been useful in combatting the pace Deeping had up front. “I can’t believe any of that will happen again. It had better not as we need to make sure we approach every game the same. “We have to keep our feet on the ground. We had a lovely write up in the Peterborough Telegraph ahead of the first Deeping game, but the lads went into their shell a bit during the match. Star centre-back Chris Hansford missed the Deeping defeat, but he will be back tomorrow to try and take care of in-form Deeping frontman Connor Pilbeam, who ran riot at the Grange during the 2-1 win for his side. Netherton start the game in fourth place in the Premier Division, three points behind leaders, and reigning champions, Moulton Harrox who boast the only unbeaten record in the division after seven matches. Moulton will receive a test tomorrow when travelling to the rapidly improving Stamford Lions who have won their last four league matches. Second-placed Ketton are at home to Leverington and third-placed Wisbech Town Reserves are in President’s Premier Shield action at Holbeach United Reserves. 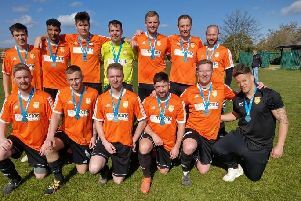 Pinchbeck United continue their defence of the President’s Premier Shield - the knockout competition for top-flight Peterborough League sides - with a second round tie at Stilton United tomorrow. Pinchbeck beat Leverington 6-1 in the first round, but they will have to tackle the rest of the campaign without inspirational central defender Ashley Murrell, who has left the area to go travelling.